Are you in the market for new hearing aids in Waterloo, IA? Whether you have used a hearing aid for years, or are looking to buy your first one, the number of options available for hearing aids these days can be downright overwhelming. Fortunately, buying a hearing aid does not have to be a mystifying process. By knowing the different features and styles available to you before buying one, you can be sure to pick the option that is best for your needs and your lifestyle. Fit and style: Hearing aids come in four basic fits: completely in the canal, in the canal, in the ear and behind the ear. 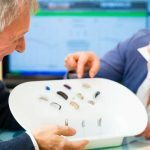 This choice is probably the most important one when it comes to picking a new hearing aid, so be sure to do your own research into what will work best for you. Noise reduction: You don’t want to amplify every sound—just the ones you want and need to hear! Most hearing aids provide noise reduction to some degree. If noise reduction is important to you, you’ll want to find a model that provides a lot of it. Batteries: Some hearing aids in Waterloo, IA come with rechargeable batteries, similar to a cell phone or laptop. This can be useful, as you will not have to worry about changing your hearing aid battery every few months. Instead, just plug it in for an hour or two each day. Telecoils: Some hearing aids come with telecoils that can plug into certain phone systems, meaning you will hear only the voice on the other end, rather than all the outside noise. This is handy if you enjoy chatting on the phone a lot. Wireless connection: These days, a lot of hearing aids come with Bluetooth or Wi-Fi connectivity, allowing you to synch your hearing aid with your cell phone, television or music speakers. This certainly comes in handy, especially if a lot of your free time is spent using technology. Remote controls: Don’t like to be constantly fiddling with your hearing aid? Remote controls allow you to easily change the volume and other settings on your hearing aid, without having to touch the device itself. Synchronization: Will you be using more than one hearing aid? Synchronization allows your multiple hearing aids in Waterloo, IA to connect and adjust to the same settings. This means that when you switch between hearing aids, you won’t have to adjust the volume and other settings. This is a must-have for folks with more than one hearing aid. Buying a new hearing aid—especially if it is your first hearing aid—can be a confusing and overwhelming process. But if you have a good idea of what you want before purchasing one, it doesn’t have to be such a difficult transaction. At Potter’s Hearing Aid Service, we take pride in helping make sure our customers know all the options available to them. Feel free to get in touch for more information!